It happens every spring. As I go through the pantry to organize empty canning jars, I discover a few sprouting potatoes searching for light in drawers or shoe boxes (my favorite storage containers for potatoes). 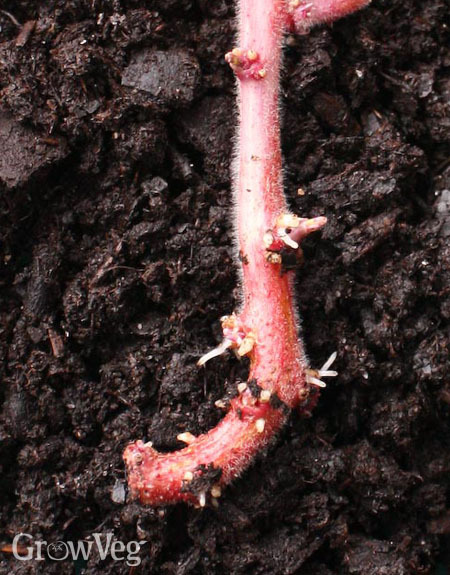 Those that are so far gone that the brittle shoots crumble in my hands get composted, while better looking sprouting potatoes get planted in containers kept indoors until freezing weather passes. These plants produce a very early crop of tender new potatoes. Note that this is but one method for growing potatoes, best suited to the special situation of having seriously sprouted potatoes on hand a month before they can possibly be planted. If you’re just getting to know garden potatoes, please review How to Grow the Best Potatoes in the World. There is more than one way to grow potatoes! Any potatoes that show bulging sprouts have broken dormancy, and are actively converting their starches into sugars and other nutrients needed for growth. Early-maturing potatoes tend to have shorter dormancy periods than late maturing varieties. You can eat slightly sprouted potatoes as long as they feel firm and you remove the sprouts first. Just like green potato skin, potato sprouts contain solanine, a bitter compound that can make you sick. Tubers that have just broken dormancy, like those in the photo at the top of the page can simply be placed in a well-lit place to green up. A few weeks of greening up, or chitting, triggers the production of more solanine, which deters feeding by voles and other critters and delays rotting. Chitting or greening up potatoes is standard practice with my main crop, but seriously sprouted potatoes demand immediate attention. If they’ve started to shrivel, sprouted potatoes are fair game for my earliest planting, which is started indoors. A sprouting potato is a marvel of reproductive botany. With a hand-held magnifying glass, you can see numerous rounded root buds near the base of any sprout, with pointed leaf buds at every stem tip. In tissue culture work, tiny bits of potato meristem (growing tip of a sprout) have been used to grow plants that produced normally. Since I grow only a few plants this way, I root the fittest potato sprouts and compost the rest. They root quickly! The white roots grew on the cutting at right after only three days in moist soil. Indoor growing space gets tight in spring at my house, yet potatoes grow best in roomy containers with somewhat breathable root space. My cheap solution is to root sprouting potatoes in double-thick paper lunch bags filled with potting soil. By the time the plants are set out in the garden, the bags are ready to decompose. One of the newer products being offered by garden suppliers are potato grow bags made out of porous landscape fabric. Also called patio potato bags, these reusable pots can get pricey, but if you can sew at all you can make your own. This Instructables video shows how to cut and sew several in less than an hour. I don’t recommend growing your main crop of potatoes in potato bags or any other containers unless you live in a cool climate, because warm roots (unavoidable in containers) cause potatoes to stop setting tubers. This is not much of an issue when you’re pushing the season to accommodate seriously sprouted potatoes in early spring. Besides, as any gardener knows who has lifted and moved volunteer plants, potatoes are infinitely transplantable. Most of the sprouted potatoes I must deal with came from my garden, and gardeners are often cautioned to start with certified disease-free seed potatoes because replanting your own can be an invitation to disease. I agree, but not when it comes to my extra-early crop. Besides, if there is any question about the health of the mother potato, you can carefully remove the stems and root them in moist potting soil. Propagating potatoes this way greatly reduces the risk of transmitting viral diseases, and eliminates having a chunk of rotting potato in your pot. My little fingerling potatoes seem to benefit from being rooted with a bit of potato intact, but I plant very robust sprouts with no bit of potato attached. And, though I don’t think twice about planting small chitted potatoes whole when planting my main crop, I try to limit how much mother potato goes into a container to reduce risk of root rots. Sprouted potatoes can be ugly or beautiful, depending on whether or not you find a place for them in your garden, or perhaps in containers on your deck or patio. Tender new potatoes grown from sprouted spuds make a great prelude to your main crop, and prove that there are many ways to grow great potatoes. "Barbara, I found this fascinating. It never occurred to me to try potato propagation. I always try to save a few of my homegrown potatoes for resewing the next year. But since we normally grow our potatoes on the ground, under leaves and straw, it's rarely an issue. Which by the way gives excellent yield without the back strain and no need to use a fork, just rake the leaves back. I normally do not save the potatoes from the 1st harvested set for more than 2 years, because of the concern about viruses and fungi. This might be a way for me to stretch my potato harvest a bit more. Thanks for the tip. " "Give this a try.Dig up a sunny spot 18" round and remove the soil 12" deep.Refill the hole with 6" of finished compost. Place 4 prepared, usually agriculture sulfer dusted potatoe pieces with at LEAST, 2 eyes, evenly spaced.Cover them with additional soil and finished compost,water well. As the potatoes sprout and grow their second true leaves,add more soil/compost so that only the second set of leaves are exposed. Continue this process until the plants are above the ground level. Place a round rubber vehicle tire over the plants, permitting them to be in the center of the tire. Continue this process, adding tires as the plants continue to grow.You can end up with a minimum of 4 to 6 tires. After that ,just let the plants do their own thing, keeping them watered at all times of course.As the season ends and the plants flower and die back,simply kick the stack over and walla,beautiful and plentiful spuds with minimal work in a probably unusable space under normal conditions! Thanks grandpa"
"what is the best way to store harvested potatoes- last year mine all sprouted when stored in a sack, in a cool, dark barn"
"I do believe that I read of a health issue with using tyres for vegetables, cannot remember any further details. Perhaps someone else has more info." "Growing a tower of potatoes sounds great in theory, but seldom works in practice. Held above-ground, potato roots get too warm and stop making tubers. A short stack of tires is great for splitting firewood, bad for growing potatoes. It is very sound method, however, to plant on top of the soil and mulch, mulch, mulch as the potatoes grow. The mulch method saves a lot of labor, and produces remarkably clean potatoes. Di, warm temperatures encourage potatoes to sprout, but I’ve even had them sprout in refrigerated storage (my favorite fingerlings have a short dormancy period). Consume your stored crop with more gusto next year. It’s a myth that potatoes stay in good eating condition all winter. The earliest to mature are usually the first to start sprouting. " "Potatoes have to be properly stored and that's key if you want to get the most from your crop. We have a homemade root cellar, it's a gutted, recycled refrigerator, buried under ground, fenced off for safety, but we cover it over with several bales of straw for insulation. I am in love with straw, we use it for many things, it's my homemade cold frame, composting material and mulch, just to name a few things. Growing taters on the ground, though for those of us who don't "bend" as well as we use to, is both easier and we have had excellent production, needing to plant fewer potatoes. I've also found, potato beetles do not like oak leaves, we've had little problem with the critters since we've been using oak leaves as a mulch cover on the potatoes." "Hello again, according to www.envocare tyres are regarded as hazarduos waste. " "I live in Georgia and have a tough time getting much of a crop. I'm new at this. Is it the heat? I tried a 1/2 barrel and the results were pathetic. My raised bed produced more, but not a lot. I am guessing that growing them on the ground with mulch may not protect them from the GA heat. Maybe in the raised bed with LOTS of mulch? Any helpful suggestions are welcome!" "I've heard conflicting info on the medium for growing potatoes in. I've heard that you can grow in straw or leaves only (no soil, compost) and I've heard that you can grow in dirt with compost. Do potatoes need soil for their roots to grow in?" "thanks Barbara - always really useful information"
"On growing spuds in tyres....Clare is right about being hazardous to your health..The prob being all the different compounds used to make tyres these days...Maybe in Tom's granpa's day they were made from REAL rubber but not now..Would suggest ditching this idea altogether.You may not suffer any illnes just yet but who knows in the future,don't forget we are blessed with our bodies to be able to retain certain chemicals and who knows what probs that bring later on !? It seems that as tyres deteriorate the compounds leach in to the ground when you water or when it rains.....we have an old boy on our allotments that uses leftover spuds,which he plants late and he always gets a decent crop for the winter,he calls them "Safeway Specials"!!" "Jan in GA, short springs make it challenging to get a good crop of potatoes, but you can do it by getting an early start with fast-maturing varieties and using lots of mulch. Also consider planting a single sunflower every 6 feet (2 meters) among your potatoes for a bit of neighborly shade. *** Brenda, I have had potatoes produce small crops when grown in half-rotted leaves, but they always do better when they can root in actual soil. I have had good luck growing potatoes in a half and half mixture of shredded leaves and soil. The have been studies done comparing the mulch method to traditional soil hilling. Hilling gets you a few more potatoes, but potatoes grown under mulch are often prettier. " "Barbara, "Hilling gets you a few more potatoes, but potatoes grown under mulch are often prettier." I have to disagree, my dear. Our production using mulch and leaves has tripled at least. Plus we no longer have a problem with potato beetles, many of my neighbors have serious problems with the pests, when they use the traditional method of planting. I'm managed to make a few converts.....LOL Evidently the beetles are all moving to better "eating ground" LOL "
"Thank you Barbara, this was helpful. It doesn't seem like straw alone would have enough nutrients for the potatoes to grow. I think I'll try digging a foot into soil, adding some compost, then potatoes, then soil, then straw. This was what Tom suggested, with the exception of the tire which will be recycled. My potatoes are now sitting in a warm spot and have just started to sprout." "I have done this before and it makes a great project for kids who like to grow veggies, the most fun comes when they can dig them up and cook what they grew." "Growing vegies with the No Dig method, can have problems like when I grew tomatoes with the No Dig method. It was the only time they got Blossom End Rot, mostly caused by lack of Calcium. Read more at " vegetable md online " (Dept of Plant Pathology, Ithaca, NY)"
"Good Potato , Organic Seed Potato www.indopotato.webs.com"
"Joley, your not the first person I've heard of that has had that problem. I think there is a misunderstanding of what you need to do before the potatoes ever hit the ground. You have to prepare the soil first. Working in lots of rich organic materials, and I always add Epsom Salts, there's plenty of calcium in my compost from egg shells etc. But you need magnesium as well, since I'm working with VA red clay, it's hard for the plants to get the trace minerals unlocked. You need the magnesium to help unlock the calcium. Who knew chemistry would be so handy??? LOL "
"@doccat5...epsom salts ?? Now theres an idea ! How much did you use per sq.yard ? Like you I grow in clay in Sussex UK,not red but clay all the same..Be interested in your answers.."
"Well, didn't really measure, just a couple of generous handfuls, along with compost and I use worm castings for fertilizer, we broadcast and spread all that and till it in to the ground. I use a spray of Epsom salts and water on both my tomatoes and peppers to increase their blossom set. 1 teaspoon to 1 quart of warm water, shake it up well and drench the plants and the ground. That little "boost" of magnesium seems to really do the trick. I saw it in Mother's many years ago and have been using it successfully for years. I also use probiotics on my soil and am experimenting with a new (for me) product called Azomite. It is another soil enhancer containing multiple layers of trace material of minerals. It's another organic product. The probiotics contain the microorganisms necessary for the plants to unlock all the available nutrients in the soil. I've seen the test beds using the Azomite and they are very impressive. I'm currently running test beds using Azomite, 1 with Azomite and my AEM-1, and 1 just my compost and worm casting. I know the AEM-1 greatly increases the production of my veggies. I think it's going to be interesting to see what happens when it's combined with the additional trace minerals. doc"
"I'd like to upload a picture of my potatoes growing in their containers, is this possible?" "You can upload photos on our Facebook page - we'd love to see them - but you'll need a Facebook account to do that." "@doccat5...Many thanks for your reply..sounds really interesting...will have to try it..especially the tom's...hmmm,shows you're never too old to learn new things again MANY thanks." "Just got to say this...one of the BEST things about this site is the hints and tips that are posted by us in the UK and our gardening pals in the US for all to share and try.MAYBE NOT EVERYTHING WILL WORK BUT HEY,ITS WORTH A TRY !Absolutely fantastic friendliness....If only ALL the world were gardeners !! " "When you plant the sprouting potato, do you plant the sprout down or up?" "approximately how long does it take till potatoes are ready for pulling up? Mine have been growing for 2.5 months and there are flowers just starting to open. " "Rachel, the direction doesn't matter, though the fastest emergence would come from an upward-facing bud...Brenda, most varieties need 80 to 90 days minimum, so you're almost there. Flowers often are a sign that small new potatoes are ready. Another 10-14 days and you will notice the plants deteriorating. Then it will be time to collect your booty." "Oh boy, thanks Barbara, can't wait to collect my booty of potatoes!" "Hello! We recently moved and this is the first year I've had room to grow potatoes, and I'm concerned they have blight! Is there any way to post a picture and have you confirm this? Thanks!" "I harvested my potatoes yesterday, yeah! The were started mid April in Northern CA, so about 90 days. There are red new potatoes, fingerlings, Yukon Golds and Russets. Do you know what are good long term storage potatoes? I'm also curious if I can start another batch in the Fall (August 1st) when our first frost is usually Oct 25th? This years weather pattern is off and we had an unusually wet and long Spring, delaying planting by about a month later. " "Brenda, the russets will be stay dormant the longest, and some fingerlings are slower than others to sprout. The problem with replanting is that the new crop "wants" to stay dormant for a while yet. You can plant more potatoes now IF you have some old sprouting potatoes on hand, or adopt a potato volunteer or two you find growing in your garden." "Heather, it's not possible to post photos on the blog I'm afraid (although you can share them on our Facebook group if you have a Facebook account). However we do have a photo showing the characteristic brown blotches on the leaves and stems in the following article which also has further information on blight: http://www.growveg.com/growblogpost.aspx?id=43"
"Barbara, thanks for your reply. If I leave the smallest potatoes in the soil (detached from it's mother root) will they start sprouting when they want to naturally or will they just rot?" "It's best not to leave potatoes behind because they are likely to pick up diseases like early blight. This is not just a theory -- I've seen it happen many times. Potatoes must be rotated. You will see volunteer plants next spring, because you never get every last potato when harvesting. Good luck." "Hi Barbara. I live in France and just harvested the first lot of potatoes. However, I see that on the deteriorating stems, new leaves are growing. Will these develop into new potato plants if I cover them up with soil? Are these (seems like) new little plants on the stem worth anything? Thank you." "Martine, your is a new question to me. In my experience, potato stems are in rough shape by the time the potatoes are ready, with many little outbreaks of fungal leaf spots and such. I don't doubt that an unusually healthy stem would root and grow, but it would be a long time before it produced potatoes, if at all. You can always experiment!" "Thank you for your reply Barbara. I saw that actually many of the deteriorating stems have new leaves. I think I will try to experiment. Who knows, I might just produce a whole new crop! " "I can't wait to get my potatos!" "can you add like a agenda on how the already grown roots but not sprouted yet potatoes grew"
"First time potato grower, novice gardener: My potatoes are coming up well here in Northern NJ. Any suggestions re: finding the early potatoes without harming the potato or the underground roots. " "Veronica, usually you can find a couple of potatoes by feeling around beneath the mulch, in the top half inch of soil, starting when the plants show blossoms. These surface tubers are best enjoyed as new potatoes because they tend to turn green. When the plants show decline, you can start gathering your actual crop." "I just decided to put in a garden. Can I start potatoes now or is it too late in the season? I'm in east Tennessee if that matters..."
"I am from the northeast, and currently have 3 burpee beefstake tomato plants growing, which are about 6 inches tall now, anf 5 sweet corn plants in a container that are about a foot and a half tall at this time. I was getting ready to slice some potatoes and freezing them. They have lots of spuds, which made me think of find a way to plant them. I will give it a try in my 2nd bedroom which I converted to growing plants, and also woodworking." "Awesome information!!! I'm in FL - ugh, THE HEAT! - and found a forgotten handful of potatoes in the pantry. They are growing! I want to plant them, as I have a rather large container garden now and the last frost just passed so I can plant all the little guys that are hardening off as we speak. I have rock and sand in the yard - so that's not an option. Can I give it a go in containers? It is HUMID and HOT here (46 deg high two days ago, 78 deg high today). And I am sorry if I missed it, but what is the BEST way to cut the potatoes to be planted? Thanks!" "Even in north and central Florida, it is best to get potatoes planted by the end of February, but you have little to lose by trying. Should you use containers, choose light-colored pots that will not absorb solar heat, and see if you can find a place that gets morning sun and afternoon shade. It would be most practical to use a large planter on wheels so the plants could be moved to shade on extremely hot days." "Hi. I need a quick answer to this. I discovered my potatoes sprouting in the cupboard- because I forgot about them and left them there all winter. (I did eat some and give away some in the beginning.) these potatoes came from my first ever try at them - I had planted them from seed potatoes that had already been wrinkled and sprouting in june and dug them up in sept after the tops died off. ANYWAY I want to plant these but they have 12 to 18" sprouts. QUESTION: Can I cut the sprouts back to 3-4 inches before planting - will they continue to grow????? I want to plant them in a week or two this time, at the end of March/beg of april. Thank you! " "I live in Texas is it too late to plant my sprouting potatoes? Thanks"
"It's late for Texas, but not too late if you can find a spot with some afternoon shade. " "@Barbara should I plant directly in the ground? Thanks!!" "Barbara, I fear that by planting sprouted potatoes from my grocery that I have introduced disease to my garden beds. I had a thriving garden for tomatoes until a couple of years ago and now only the hardiest tomatoes lives through the first few months of garden season. Those plants that do make it are diseased too. I live in Alabama and use no-till practices while actively working to encourage a thriving micro herd. Because we eat a LOT of chiles and paprikas, it would be nearly impossible for me to stop growing members of the Solanaceae family but have been told that that would be the only way to rid ourselves of disease. I'm afraid I have not figured out what the disease is yet. Reading the descriptions on several websites, it sounds like verticillium plus late blight. " "LB, I gardened in Alabama for years, and was never successful with varieties that lacked resistance to fusarium and verticillium (VF). Many classically-bred hybrids carry this resistance and more. Please try growing whatever hybrids your neighbors are growing. You may be surprised at your success!The only heirloom I found that could stand up to the climate's disease pressure was Tropic. " "Thank you for the information, Barbara. I'll see if I can find some Tropic seeds and try them. My one success last year was one Homestead plant. I'm going to miss the striped Romans, Matt's and Granny Cantrells. Even containers won't work for them now. " "My second graders would like to know why the sweet potato in our room has stems and leaves growing from it, but it has never been in soil, never been watered, and never been in the sun? We can't find a good answer using Google. " "To Mrs. Waters' second grade class: The sweet potato contains a vast reserve of nutrients in its flesh -- the part we eat. As long as it has warmth, it will put all the energy it can muster into new growth, because all plants are on a mission to grow a new generation of offspring. The buds on a dormant potato or sweet potato are packed with specialized cells, destined to grow stems or roots, as well as undifferentiated cells that can change into whatever type tissue is needed. Your potato is putting everything it has into growing stems and leaves, and is counting on you to break off the stems and plant them in soil. Good luck! " "when do potato brake dormancy?" "Dormancy period varies with variety, but most potatoes can be coaxed out of dormancy after three months. Chilling in the refrigerator for a couple of weeks and then moving the tubers to a warm place often gets potatoes in the mood to grow buds." "Last year I grew 1 sprouted red potatoes cut up into 3 pieces in the raised bed and left it for 2 1/2 months here in Pa. and it gave me back close to 5 lbs. I only put them in until it was time to put in string beans. Now I have found out more that both are from the Night Shade group and should not be planted there again. However, I had replace more than half the soil and have already growing plants in that bed again. They have only come above ground by 4 inches as well as the 5 inches deep I planted them so now should I take them out and try to move them all into 5 gallon buckets? Or give them a food of some kind. The original material was mushroom house clean out and is probably spent by now." "Sorry they are not from the same group the tomatoes I planted in there was from the same group so that makes it 3 crops in a row now that would be taking the same foods out of the soil." "Peggy, with the crop well underway, just leave things as they are and harvest your crop as usual. A few soil pathogens can infect both nightshades and beans, but the two plant groups take different nutrients from the soil. In late summer, you can cover crop with a grain crop or leafy greens to change what's going on with your soil microbes, or use the spot to grow winter onions." "Hi, I just found a 'forgotten' bag of potatoes with sprouts that are for the most part over a foot long, some as much as 2 feet long. Are they useful for growing? If so what method would you suggest?" "At this late date, I would be tempted to put them in a wide trench, sprinke on an inch of soil, and them mulch with lots of grass clippings if they start growing. Sometimes late-planted potatoes give impressive yields." "I just looked at my red potatoes and they are starting to sprout out of the eyes. It's October 26. What can I do if anything to slow this down (if any) for Spring planting? " "If your potatoes are already starting to sprout, go ahead and eat them. They won't go back into deep dormancy, and will start to soften. In spring get a new supply for planting. My purple potatoes are sprouting, so we are eating them often! " "I think this is cool that you know every about potaoes "
"I think its best to grow potatoes in long hills on the ground. Start with a 6 inch hill, plant potatoes with sprouts pointed up under 4-6 inches of soil. As the potato plants grows backfill soil around the plants several times through the growing season. I take the pickup truck to the garden center 3 times during the summer and get a half yard of garden mix soil to backfill the plants. This creates a larger pile of growing medium for the potatoes to grow. You fill find that the potatoes grow all the way to the top and edges of the hill. At the end of the season the hill should be 12-18 inches tall. Water regularly and toward the end of the season the green plant will die off. The potatoes will stay good in the ground until freezing temps arrive. Harvest any remaining potatoes, rinse the soil off with water hose and store in a cool dry place. They will last most of the winter. I just use a standard garden shovel to turthe soil over and there they are. I am able to harvest around 120-150 lbs of potatoes from 3 30 foot long hills using this method. Watch for potato bugs crawling on the green stems in the summer. They look like a brown/tan beetles, smash them. Plastic containers heat up too much. Cloth grow bags may not trap as much heat and surrounding bags with straw to keep direct sunlight of the bag. " "I live in the philippines and was planning on trying the tire method, but am now concerned by the chemical aspect of it. Temps right now are typically 30C to 34C in daytime, 26C-28C Night Time. The comment about the roots being too warm using tires is also interesting especially over here.with our temperatures. When would be a good time to plant Spuds in this part of the world and would they need to be shaded all day or part of the day? I would like to keep a crop going all year if I could, planting a new batch every 6 weeks or so. Potatoes are pretty expensive to buy here and we do not know what chemicals have been used on them. Thanks "
"In the hot season you will be better off growing sweet potatoes, which thrive in heat. You will do best with regular potatoes from Nov-Feb when soil temperatures are cooler. Good luck!" "I live in North Georgia, and I was wondering if you can plant potatoes in the fall or is March the recommended time?" "I live in NZ and its time to plant later spuds now. I was wondering how SMALL sprouts can be before you plant. Ive had the seed potatoes I purchased in a warm dry light place for 5 weeks now and they are only 1cm long, - getting very Impatient! Jenny"
"Have you ever considered writing an e-book or guest authoring on other blogs? I have a blog based upon on the same subjects you discuss and would love to have you share some stories/information. I know my audience would appreciate your work. If you are even remotely interested, feel free to shoot me an email." "Im planting some seriously sprouted potatoes in large pots but im not sure where to keep the pots. They will get great light on my 3 season porch but its not heated and will get pretty cold (we are still getting temperatures close to zero at the end of January). I could keep them in the basement which is slightly warmer but wont get as much sunlight. Which place would be better? Once it gets warm out should i keep the pots outside in the sun? Will they get too warm with the afternoon sun beating on them?" "Hi Michelle, I would always recommend going for a light location more than warmth, as long as it remains above freezing. If the weather drops to near-freezing then you can cover them with cloth or bubble wrap at night if it's just a light frost, or bring them indoors at night." "I would like to know more Bout this paper bag method. I am about a mon away from time to plant in the ground, and my seed potatoes have sprouts ranging from 2-12 inches long. If I plant them now in paper bags, how deep should I plant them (potato near the bottom of the bag, then fill with soil to cover the sprouts?). Once I have them planted, should I keep them in a warm sunny place, or would cool be better, so it doesn't shock them when I move them outside?" "Cindy, it sounds like you already know a bit about growing potatoes -- great! The main roots you want to foster are those that grow close to the tuber. As you plant the sprouting potatoes in paper bags or other containers, many of the long sprouts will break off. I suggest using about 1.5 inches (3-4 cm) of potting soil below and above the sprouting potato. Yes, the early plants will need hardening off and possible frost protection, so you might plan on using a row cover tunnel for a few weeks. Good luck! " "I've just planted my 1st early potatoes, Arron piolet 1st earlys. They have been chitting on egg boxes in my spare box room for the last 3 weeks(( I did turn the heating off to prevent over growth due to the heat.. I dug a 9 inch trench, filled with a layer off manure, then put my chitted potatoes in gently. Then coverd the sprouts with a general purpose compst then a final layer of manure then finished off with the well worked garden soil about 4 inch!! So the potato seed has at least 7-9 inch off protection from any spring frosts.."
"Not so sure I would use all that manure on potatoes because it increases risk of scab, a cosmetic disease of potato skins. If your soil is quite acidic perhaps that won't be a problem. " "What do you mean by [sets] Thanks Ken"
"Hi! I have a question about my potato plants. Quail have attacked our potato plants, and gobbled up most of the leaves on almost all of my plants. The plants look green, and healthy despite the lack of leaf structure. There are a few tiny leaves at the base of some of the plants, if that means anything. I have put some netting over all of the plants, and I was wondering if I lightly fertilize the plants, and water them well, could this stimulate the plants to try to get some more leaves on them, and start over? I am all for experimentation, and all. I know the leaves are an important part of the plants, but I am still holding out for some hope. Thanks for any information, you could give me. Chris"
"This is Chris again. I am sending my e-mail again, as I am not sure I sent it correctly." "Chris, if the potato plants were less than one foot tall when the birds ate them, they will probably come back strong. I would not replant them unless you see no recovery coming along in a few days. Those must have been some hungry quail!" "HAve a sweet potato that has sprouted big time...wondering if its too late to plant outside , perhaps in larger container or if I should try indoors? And how large a container? Totally neophyte here! We are in N Texas "
"You can grow a sprouted sweet potato into a very impressive vining winter houseplant in a 10-inch or larger container. In spring, the vine tips can be rooted and grown into new plants. " "I read your article about sprouting potatoes and had a question. I've got sprouts on some multicolored potatoes I got and forgot to eat; I'd love to plant them and grow my own. The problem is that it's now early October and I don't know how to keep them happy over the winter until they can be planted. I hate to waste them since they're so pretty, but don't know how to care for them. Thanks for any help." "Marissa, this happens a lot, and you have to either eat the potatoes or ditch them, because they won't hold until spring. Starting in February, you can put sprouting potatoes in a sunny spot to prepare them for planting, but until they it's just not their season." "I'm ready to start the chitting process but don't know what to place the pieces of potato on. Should it be something porous to absorb any moisture or something like paper towels?" "Phillipa, you can roll those is garden sulphur ( it helps protect the spuds from disease) and lay them out on newspaper to dry, "
"Cut seed potatoes don't really drip. The most common practice is to let them air dry for a day, and then store them in a paper bag until they are planted. Good luck!" "Thank you Barbara and Doccat for your answers. I just got my babies in the ground and am now saying my Mother Earth prayers. I hope I have as much luck as many of the others on this very helpful site." "I am looking forward to using all the input from you expert potato growers to grow some sprouted potatoes with my grandkids. I have not grown them in years,I probably grew them in tires back In the 80s. I only done boxed beds since moving from where I had both. Still all expert advice from different methods will be helpful to grow them in North East IL this year. Great tips. " "Potatoes should grow beautifully for you in IL. Good luck!" "Please don't use tires to plant vegetables. The toxins that go into their makeup can leach out into your veggies overtime. Check the web there are plenty of other alternative methods that will work using the same method, just a different planter. Good luck. " "I know tires are bad. As well as railroad ties that were also popular, then the treated green landscape timbers for boxed beds were arsenic laden. I had 12" redwood for my very first boxed beds, then TJIs, then just 2x12s, my last garden was behind an 80' long two level block retaining wall. Now it will be in HT pallet raised window boxes as I cannot bend, kneel, squat or even lean in to reach, due to multiple long segment spinal fusions. I can't wait to get them finished and planted. My almost 10 year old granddaughter just loves to dig with the big spade shovel, they also have great soil, so we will be planting the potatoes in deep holes and back filling with soil and straw layers as the plants grow. How does that sound? I am most excited about rooting the sprouts instead of cutting up the potatoes. I put the sprouting potatoes in a paper back under the sink but probably not the right thing to do, after reading about giving them light to green them up. But they did not have true sprouts or legs as I like to call them. Any extra tips would be appreciated. " "Looking forward to it, but the saddest thing is never being able to get down in the dirt with them, showing them close up with my hands next to theirs. Really tearing up with lots of emotion. My gardeners heart wanting to share with my sons 4 precious children. At least the oldest one may have the gene. ??" " Last summer I tried the tower potatoes which was 4 inches of ground and then I layed my potato sprouts down and then I laid down 4 inches of straw then 4 inches of ground and more seed potatoes then 4 inches a straw and I put this inside of a large round Frame of chicken wire and it did not work at all . Planted 5 pounds of sweet potatoes and got three potatoes?? When I read the directions it seemed very easy and then falling just pulled up the cage and your potatoes would fall out of the ground but there were no potatoes !" "Debbie, you did nothing wrong other than believing in bad information. The soil temperature gets so high in towers that the potatoes stop making tubers. Potatoes need cool soil, which is down in the ground, not up in a bin. Regular potatoes sometimes do well in bins where nights stay cool, but a second problem with sweet potatoes is that they form their tubers in a cluster, right under the primary crown. The bin method covers the crowns, giving the plants little hope of success. Don't believe everything you see on the net. " "Great thread with information I haven't found anywhere else, such as planting my sprouted potatoes in bags while I wait for temperature of higher than negative number in Minnesota, US. Plus only place where my main question was answered: can I plant the large sprouts that separated from the mother potatoes. Thanks, first time I come across your guides. " "I saved fingerlings potatoes from last to plant but some have sprouted with very long shout ,are they still good to plant, should I remove the long sprouts or them?thank you"
"Claude, some of the long sprouts will break off when you plant the potatoes, but they will still be okay. Do leave the sprouts on, because roots or leaves will grow from them. Good luck! "